Das Ethiopian Restaurant at 28th and M Streets held its Ethiopian coffee ceremony June 21 on the outside patio of the restaurant. 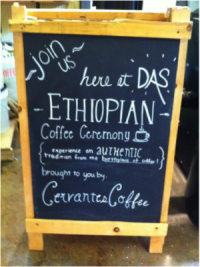 Invited dinner guests sampled the Das Ethiopian Exclusive roasted Sidamo coffee, which was introduced to the group and is available for sale. Guests delighted in the unique coffee ceremony. After all, coffee originated in Ethiopia.